Blue Shield colleagues in Germany remember well the overwhelming international solidarity after the last big fire disaster in a worldwide famous library: the Anna Amalia Library in Weimar. Our monitoring effort for the ‘Institut d’Égypt’ is also a way of showing our gratitude to the international heritage community, who has helped us so many seven years ago. Less than one year after the big fire in this famous library, its building has been completely reconstructed. There had been several offers - from the French government to the Emir of Sharja - to rebuilt it. Finally, the building has been reconstructed by the Egyptian army. 70% of collection are lost, but thanks to many donations, the collection now stands at around 25,000 books (formerly: 40,000). Prof. Mahmoud Hafez, the president of the Institut d’Égypte, died on December 23, at age 99. The executive board of the Institut reacted quickly: In an urgent meeting on 26th December it elected the new president and its deputy. Since 1966 he has been Chairman of the Department of Surgery at Cairo University and is known as the Father of Surgery in Egypt. He also served as the Egyptian Minister of Health (1976-1978) and as President of the Cairo University (1978-1980). He was awarded the “Ordre des Arts et des Lettres” by France in 1983. He holds a M.R.P. and a PhD from Harvard University. From 1972 to 2000 he worked at the World Bank, the final eight years as vice director. He has been director general of the Bibliotheca Alexandrina since its opening in 2002. He is internationally well known and highly esteemed: 26 honorary doctorates prove this as well as awards from four continents – among them the French “Ordre national de la Légion d'honneur“ and “Ordre des Arts et des Lettres (Commandeur)”. He tweeted on Dec 26: “Today, after the awful fire, I am meeting with the Board in that same Al-Sennary house, where the Institut was born, to relaunch it anew! The administrative board of the Institut decided to allocate its old headquarters Bet El-Senary, a historic site at Sayeda Zeinab, as a temporary headquarters to gather and preserve the sound manuscripts, and hold the scientific lectures and seminars. The board decided to open a special bank account to accept donations for rebuilding the complex and buying copies of the manuscripts and maps that were lost in the fire. The Technical Committee which was formed to check the status of the damaged building presented its preliminary report. Dr Ali Abdul Rahman, its spokesman, confirmed the possibility of rehabilitation of the building at a cost of close to 7 million Egyptian pounds (about 1.1 million $). Interpol was notified about books and manuscripts that were stolen amid attempts to salvage them, according to Mohamed El-Sharnoby, general secretary of the Institut. He added that he formed a committee to receive a number of books retrieved at Cairo's South Court as well as a number of books retrieved by police." Unfortunately, the perpetrators infiltrated the volunteers who saved the books from the blaze as we didn't have the chance or the mechanism to sort them out or to check all volunteers," he said. El-Sharnoby added that some manuscripts were left on the pavement in front of the American University in Cairo (AUC) until they were loaded in cars to be delivered to Dar El-Kotob to be restored. Major General Hamdy Badin, head of the military police, had said in a brief phone-in on Al-Hayat TV channel that one of the vehicles that carried the salvaged books has been stolen. The general secretary and the administrative board of the Institut thanked in a statement Egypt's youth for their participation in saving the books from the fire. El-Sharnoby said he couldn’t yet estimate the number of books that have not been affected severely by the fire, explaining that there is still a large number of books under the wreckage of the complex. El-Sharnoby added that around 100 volunteers from Egypt and abroad are working 24 hours a day at Dar El-Kotob to restore the books, pointing out that the restoration process may take a very long time with some estimates citing 10 years. The Rare Books and Special Collections Library and Archives (RBSCL) sent nine of its staff members last week to assist Dar El Kutub [Egyptian National Library] in the salvaging of books and documents damaged during the recent fire at the Institut d’Egypte. These volunteers, who are experienced in handling rare and fragile materials, helped to identify what items might be retrievable. They assisted in the first effort to salvage these materials. “The volunteers have returned several times to continue the effort of sorting through the debris resulting from the fire, since the books had become charred and very mixed up masses of wet paper,” said Philip Croom, associate dean of RBSCL. Describing the process, he explained that sorting salvageable from lost items starts with drying out everything on newspapers and sheets in the garden, and then categorizing them in the hope of being able to reassemble a book or its parts some day. “It’s long, tiring and discouraging, given the magnitude of the burned items,” said Croom, adding that a typical work day involves two shifts of five to eight hours. Who is to blame for? The "Institut d' Égypte" had been established in 1798 by Napoleon Bonaparte (based on the French post revolutionary model “Institut National des Sciences et Arts”). It is the oldest scientific institute in Egypt and Middle East at all. It has the most rich and rare library in Egypt. It was closed down in 1801, but work continued in France. In 1836 the "Société égyptienne" resumed its work, was tranferred in 1859 to Alexandria ("Institut Égyptien"). It returned to Cairo in 1880, and in 1918 it was reestablished as "Institut d’Égypte". On the ground floor of the building, there is a large hall with a huge library that contains number of rooms used for storing books. The first floor contains a lecture hall for meeting and seminars, as well as the offices of the head of the Institute and his assistants. The Egypt’s Institute is, according to Resolution 1611 of 1995, a listed Islamic and Coptic monument. The neoclassical building (early XXth cent.) is managed by a local non-governmental organization. It forms part of the scientific complex of the “Geographic Society” which has its seat in Qasr al-Aini Street in the over next southward building. Professor Mahmoud al-Shernoby is the president of the Institute. New initiativesSome years ago, the Bibliotheca Alexandrina (BA) has been taking the initiative in reviving the Institut d’Egypte. In order to preserve its collection and make it accessible to the public, BA has suggested nine projects for its revival, among which is a project of digitizing its entire collection. This will be the first attempt to digitize and publish a collection of such rarity and value. The library: How many books? There might be also confusion with the nearby library of the Geographic Society, which counts 35,000 volumes. As this is rather puzzling, I tried to estimate myself: As far as I know, the library was situated only on the ground floor. The internal size of the building is approximately 20 to 7 meters; this would enable a maximum of 54 meters of bookshelves along the walls. According to the available pictures, they were extremely high, and each of the 13 boards may contain approximately 40 volumes. This rough estimation would result to a total of 28,080 volumes. "Description de l'Egypte was the outcome of the collaboration of more than 150 prominent scholars and scientists who accompanied Napoleon in 1798, and some 2000 talented artists and technicians. For over 20 years, they systematically examined almost every aspect of contemporary and ancient Egyptian civilization, producing 20 volumes of text and plates of unmatched accuracy and detail. Historically, these engravings became the most comprehensive record and inventory of Egypt’s land and monuments. This valuable collection containing images related to antiquities, natural history, and the modern states of Egypt has been fully digitized and integrated on a virtual browser with the objective of preserving it and making it publicly accessible." The first edition usually consists of nine volumes of text, one volume with description of the plates and ten volumes of plates. Two additional volumes in Mammut size (also called Elephant plates) contain plates from Antiquites and Etat Moderne and finally one volume of map plates (Atlas), making for twenty-three volumes in all.The typographical quality of the texts, the beauty of engravings, and the unusual formats (the Mammutfolio is 1m x .81m) makes Description de l'Égypte an exceptional work. The area near the Tahrir square had been for days a “battle zone”. Ten people lost their live there. Nearby is the Shura Council (Madschlis al-Schura), one of the two chambers of Egyptian Parliament. During the clashes a day earlier, parts of the parliament and a transportation authority office caught fire, but those blazes were put out quickly. The library was a scene of intense confrontation Saturday. A dozen men dressed in military uniform were positioned on the library roof and threw cement blocks and rocks on the protesters and sprayed them with water hoses to push them away from the building. But protesters hurled back rocks as well as Molotov cocktails. Then a massive explosion erupted, apparently originating from inside the building, and black smoke billowed. The fire started on the lower floors of the building, but later reached the higher floors. The fire brigade is located in the same street, but the firemen arrived very late at the site, and could not initially control the fire. “The Institute’s director, Mohammad al-Sharnoubi, wept over the destruction of this precious heritage while soldiers allegedly standing idly by or poking fun at him. Sharnoubi remained standing in front the burning building, crying out “Disaster, disaster! The history of Egypt is burning, people!” He waited for the fire trucks, but they didn’t arrive until the fire had already destroyed the ancient library’s furniture and collection. Fearing the man would have a heart attack, revolutionaries and students from the American University in Cairo made him sit down on the pavement opposite the Institute. The earliest available video is showing the situation immediately after the fire had broken out. It proves that there had been several persons on the roof of the building; they seem to throw something down on the protesters - and they continued their activities despite the growing smoke and flames. This video doesn't show any activity (or alarm) of a fire brigade. A later video shows the institute fully ablaze, but still no activities of a fire brigade. Both sides blame the other. The army blames the protestors for throwing a Molotov cocktail into the building. Eyewitnesses were reported to have seen protestors throwing a Molotov cocktail at stone-throwing soldiers at the Shura Council building, but the projectile missed the intended target and instead landed in the Egyptian Scientific Institute. The protestors claim that the army was using the building as a base from which to attack them and some have even suggested that the fire may have been started deliberately by the army to descredit the protests. A picture of a suspected arsonist is being discussed on Facebook (http://www.facebook.com/photo.php?fbid=209677945781537&set=a.175602812522384.44469.175598845856114). If you want to read more on speculations on "Who did it? ", you may read Paul Barford's blog. Of course, there might have been some books stolen in such a chaotic sitation. But if you watch the many videos and pictures showing young people transporting books, it looks much more as spontaneous as well as organized salvage operations by protesters. So we have to be very careful and not mix up theft with the rescue. Anyhow, a public call has been issued to return books taken from the library and bring them to Quasr El Dobara Church (later on: to the National Library). Bernard Valero, the French minister of foreign affairs spokesperson, called the destruction a "cultural catastrophe" and urged the Egyptian government to begin an exhaustive and transparent investigation, in order to find and punish those responsible. He added that France would consider any request from Egypt to help rehabilitate the gutted institute. Protesters began salvage operations on Saturday, as fighting continued around them, removing books and manuscripts from the building and arranging them on the pavement outside. They made contact with officials at the Ministry of Culture, who arranged to collect the works and remove to the safety of the Dar al-Kutub building on the Corniche. The first to enter the building and save documents did so while the fire was still raging. 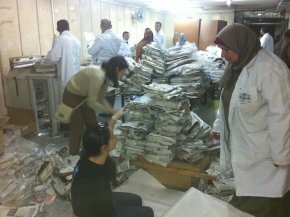 Since Saturday night, activists and protesters, and later conservators and volunteers with Dar al-Kotob, have been trying to salvage books and documents scattered around and within the building. On Saturday night, protesters — wary of rocks, fireworks, Molotov cocktails and gunshots — made their way through the clashes. They swept Sheikh Rihan Street, moving thousands of scraps of paper and leather along the exterior of the American University in Cairo’s Ewart Hall, where they sifted through them under the gaze of armed soldiers. The soldiers, assisted by several plain-clothed individuals, had created a clearing between the protestors and their own barb-wired barricade, covering most of the area where the documents had been dumped. On Sunday, as the fighting continued, protesters continued to drop off books at the military checkpoint guarding the US Embassy. The lieutenant on site confirmed to Egypt Independent that it was protesters who brought in all the books. “It’s civilians who are managing the whole rescue operation,” said a young member of the popular committee. “This has been the case even before the military built the wall on Sheikh Rihan.” The popular committees are coordinating with cultural activists and conservators volunteering with Dar al-Kotob, he explains. 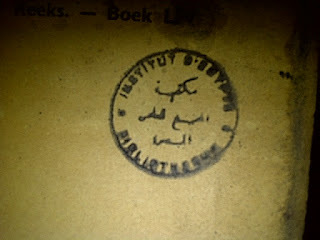 The "National Library and Archives of Egypt" (Dar El Kotob) started to save the collections. Many Egyptian volunteers assisted in extracting the books from the fire. Many trucks – some report of 16 – moved the rescued books to the National Library. "Every now and then the armed forces tell us that the conditions are stabilized enough for us to go search for more of Egypt's historic books under the ruins of the complex," Arab said. He added that the armed forces deliver the books to the library and a group of the library's employees looked for books under the wreckage. "Also some protesters call us if they find any book or document that was inside the complex," he said pointing out that it is difficult to retrieve the books due to the ongoing clashes. The Minister of Antiquities Mohamed Ibrahim appointed an archaeological, technical and engineering committee, headed by Mohsen Sayed Ali, the head of the Islamic Antiquities Sector of the Ministry. The Ministry of Culture also formed a committee to oversee the restoration of the salvaged books and manuscripts. It is made up of experts drawn from the High Council for Heritage, the High Council for Culture, and the Library of Alexandria and headed by Dr. Mohammed Saber al-Arab, secretary general of the Dar al-Kotob publishing house. Another committee for the same purpose was formed by the National Authority for Cultural / Civil Co-ordination. As you know lots of books were damaged and destroyed yesterday when the Institut d'Egypt was set on fire. The salvaged books have been handed over to the Dar al-Kutub, who are now organizing a rescue effort led by my amazing book conservator colleagues and involving DAK's staff of conservators. We're getting a vacuum packing machine there to stop the development of any mold. Here's a list of materials needed in large quantities. Please deliver to DAK Corniche. We are also ready to purchase them, but it would be great to get them delivered asap. One of the most important things is the bags-- we needed them to vacuum pack the books, so we need the bags used by food companies to vacuum pack food. It is extremely important to find a company which will sell or donate these bags in bulk. Please reach out to your networks and help us save these books. The first 24 hours are crucial. This is my number for anyone who needs to reach me, 010 6664 7823. I am heading over there. We don't need people now as the staff of the Dar Al Kutub is working, but in a few hours we might need help to register supplies, organize things, etc. After the spring revolution in Egypt, nobody should be surprised that web 2.0 is playing a major role also in organizing support for the damaged books. Beyond the web pages in Arabic language, there are some in English as well, which may give you a good impression on what’s going on. Already two days after the disaster, Elena’s “Appeal for Materials to help …” was widely circulated by websites, forums, blogs, mailing lists and social media – and also by me. Some colleagues were irritated by receiving an obviously unofficial and half anonymous appeal with such a precision in professional needs. But that’s the web 2.0 way: You don’t wait for any official statement. If somebody takes a convincing initiative, you are ready to respond. Meanwhile the most important English web 2.0 tool is the Facebook group “Save the Books”, moderated by Nader and Adham Hafez (and others). If you’d like to update yourself on News about the ‘Institut d’Égypte’, I’d like to recommend you the “Ancient Wolds Bloggers Group”. There have been many other bloggers worldwide, who showed their concern and informed their readers. La Tribune de l'Art published a professional report in French by d’Arnaud Ramière de Fortanier (Inspecteur général honoraire des Archives de France et Président de l’Association du Souvenir de Ferdinand de Lesseps et du canal de Suez). The Disaster Relief Task Force of the International Council of Museums (ICOM) has been very active in monitoring, because - due to its intense activities for museums and archaeological sites this spring - it has very good contacs to heritage colleagues in Egypt. As ICOM is a very active partner in Blue Shield, it has supported also its important first assessment mission in February. Minister of Antiquities Mohamed Ibrahim said the ministry would help in the restoration of the Geographic Society as well the collection of rescued books. Saber al-Arab, secretary general of the Dar al-Kotob publishing house and the committee, said they will only accept help from national bodies, such as the Ministry of International Cooperation, after they received offers from a number of different organizations and entities. Arab said that they received offers from UNESCO, the library of the American Congress and the Egyptian Ministry of International Cooperation. However, Arab said he currently cannot request any help until there is a final report on the damages. "When we will request help, we will ask the national authorities like the Ministry of International Cooperation to provide us with what we need," he added. The same message we get from the Facebook group “Save the Books”. Several foreign colleagues have put the question: “Can I do something from my country?” The standard answer was: “We will let you know if there is anything you could help with. Thank you so much for your kind support to our cause!" Sheikh Sultan Al Qassimi, Governor of the Emirate of Sharjah: He offered to bear the whole cost of the building restoration, and will donate some of his rare acquisitions from his own library to the Institute. Already one international heritage organization has been successful in contributing to the first aid: The Culture Emergency Response (CER) program of the Dutch Prince Claus Fund provides two vacuum packers and bags for salvaging the documents – items most needed right now. If you already have a partner in Egypt, contact him. Funding in cash will be welcome any time – the sooner the better. If you want to offer material or your service as volunteer expert, you better should wait for the final damage assessment and for the call for assistance by our Egyptian colleagues. There are contradictory statements on the stability of the building. After having inspected the building complex Mohsen Seyed Ali (head of the Islamic and Coptic antiquities at the Ministry of Antiquities and Chairman of the archaeological committee) said that the building is in good condition, stressing that although affected by the large incident in the building, but all the walls of the building were not damaged by the fire. Egypt’s minister of state for antiquities said that, according to official reports, the two-storey institute had been partially damaged by fire that had led to the collapse of its first- and second-floor ceilings, as well as the destruction of its wooden windows and arcades. Sayed told Ahram Online that all of the building’s internal walls had been destroyed but stressed that its supporting walls were still well preserved. Restoration work will begin as soon as the tense political situation in the area is brought under control, he added. The two-story historic institute near Tahrir Square, is now in danger of collapsing after the roof caved in. What remains inside the historic building near the site of the clashes are piles of burned furniture, twisted metal and crumbled walls. A double human chain of protesters surrounded the building Monday. The committee formed by the minister of culture has ordered the evacuation of the building. The committee gave the order on Thursday, fearing the building may collapse at any moment. The committee stopped evacuating the books, and consulted a contractor to inspect the building, who confirmed that it was near collapse. There had been also recent warnings on Twitter not to dig for book in debris on the soil. “The books are under layers of smoldering wood. As soon as they are exposed ti air, they burn." "The burning of such a rich building means a large part of Egyptian history has ended." Al-Sharbouni said most of the contents were destroyed in the fire that raged for more than 12 hours on Saturday. Firefighters flooded the building with water, adding to the damage. William Kopycki, a regional field director with the Washington D.C.-based library said the body of work that was destroyed was essential for researchers of Egyptian history, Arabic studies and Egyptology. "It's a loss of a very important institute that many scholars have visited." 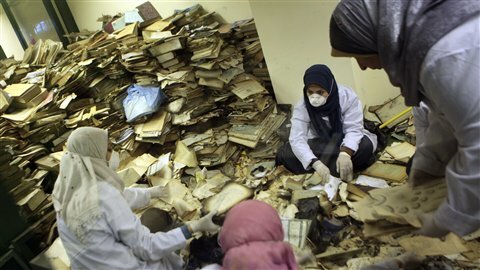 Lisa Anderson, president of the American University in Cairo (AUC) which has a campus near the institute, says "It is impossible at this point to estimate what is lost, since some books and other materials were rescued by private individuals, and we do not know where they are," she says. "Presumably they will begin appearing, either delivered to the Dar al-Kutub or in the used books markets, over the next weeks and months." Anderson called the event "a terrible tragedy for the historiography of Egypt," adding that "the response of the scientific and scholarly community has been very heartening." Bernard Valero, the French minister of foreign affairs spokesperson, called the destruction a "cultural catastrophe"
Anderson expressed hope for the collection, which she characterized as "a wonderful, somewhat eccentric, irreplaceable archive of mostly 19th century history and geography - books, manuscripts, and maps." How many Books are lost / saved? Dr. Zein Abdel Hadi, the head of Dar el-Kutub, said that volunteers managed to save around 30,000 of the 196,000 books in the Institute’s collection. 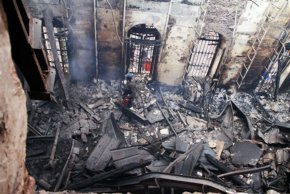 Seventy percent of the books and manuscripts were damaged in the fire that engulfed the Scientific Complex on Saturday amid clashes in downtown Cairo, according to Saber al-Arab, secretary general of the Dar al-Kotob publishing house and the committee formed to measure the damages. "With the naked eye, I believe around 10 percent of the books are sound, 20 percent can be restored and 70 percent are totally damaged." At least 11 copies of the manuscript worldwide are preserved. Culture Minister Shaker Abdel Hamid said on Monday that Egypt has three first edition copies of Napoleon’s "Déscription de l'Égypte": "There is one at the Dar al-Kotob, another at the Egyptian Geographic Society and a third incomplete copy at Assiut University." Abdul Hadi, who is a member of the committee tasked by Prime Minister Kamal Al Ganzori to transfer the contents of the complex to a safe location, said “the majority of the folders of the Description de l'Égypte are intact and the remaining folders were only burnt at the edge,” and stressed that the priceless manuscript was not stolen. “I believe the majority of the manuscript is intact, it however, may need some restoration,” he said. “We found many folders intact and only one folder burnt at the edges. There are other folders on its way to us,” he added. John Dunn reports from his visit in May 2006: A card catalogue exists, but must be cross-indexed with a ledger system for the current numbers. The National Library announced that some PCs were rescued and the electronic catalog of the library was found and safe. Dr. Mohammed Ibrahim, Minister of Antiquities stated that there is also an initiative of the French government to contribute to the restoration of the Academy and its contents, pointing out that he will tomorrow address the Sheikh Sultan Al Qassimi, Ruler of Sharjah and the French government to coordinate with them on implementation mechanisms for the restoration Academy. The final result of the first inspection by the committees: The building needs 2.5 Million Egyptian Pounds ($420.000) for restoration, and this process will take 1 year according to Mohammed Ali Ibrahim the Minister of Archaeology. The National Authority for Cultural Co-ordination stressed that it is ready to restore any historic building damaged by this fire. Soleiman Hozayen, the head of the Egypt’s Institute, has already come up with a plan to repair the stricken building and update its library. Also the Engineers Syndicate said it is preparing a plan to restore the building. At Dar al-Kotob, dozens of conservators are going through the rescued books. Several institutions are coming in to help, including the Cairo University Library, the Bibliotheca Alexandrina, and the Rare Books Library of the American University in Cairo. "There are some books, documents, records and manuscripts that are totally damaged and unfortunately cannot be retrieved. For those we can work on, we start by drying and sterilizing them in dry vacuum packing bags to reserve it from mold," he said. The second step, Arab said, is to start restoring the books to their original form. "We use specialized restoration labs for this process, but we cannot start doing it before collecting all the books we can," he added. Below Abdel-Hady's office, dozens of people sifted through the mounds of debris brought to the library. A man in a surgical coat carried a pile of burned paper with his arms carefully spread, as if cradling a baby.The rescuers used newspapers to cover some partially burned books. Bulky machines vacuum-packed delicate paper. 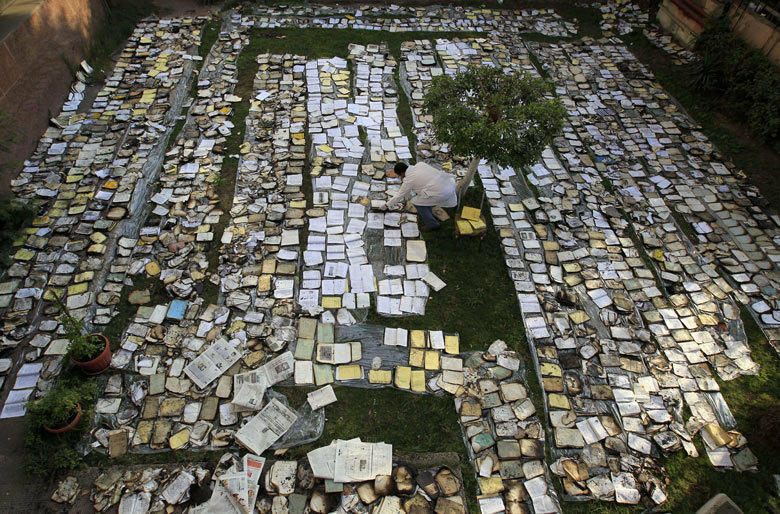 At least 16 truckloads with around 50,000 manuscripts, some damaged beyond repair, have been moved from the sidewalks outside the U.S. Embassy and the American University in Cairo, both near the burned institute, to the main library, Abdel-Hady said. He told The Associated Press that there is no way of knowing what has been lost for good at this stage, but the material was worth tens of millions of dollars - and in many ways simply priceless. "I haven't slept for two days, and I cried a lot yesterday. I do not like to see a book burned," he said. "The whole of Egypt is crying. Lisa Anderson, president of the American University in Cairo (AUC) which has a campus near the institute, says the Dar al-Kutub, the National Library and Archives, is leading a rescue effort by scholars, library specialists, and archivists. AUC is providing student and faculty volunteers and supplies from its own rare books library. Restoring will be done and coordinated by the "National Library and Archives of Egypt" (Dar El Kotob) . Also cooperative efforts are running now to restore the saved items. American University in Cairo (AUC) and Bibliotheca Alexandrina are participating effectively.